The Chiawelo Community Practice had a splendid day giving stakeholders from Ward 11 and across Soweto/Johannesburg a ‘taste’ of what they do daily in CCP. A word commonly used by participants was IMPRESSIVE! Well done to the team. Do you think headline is fair? 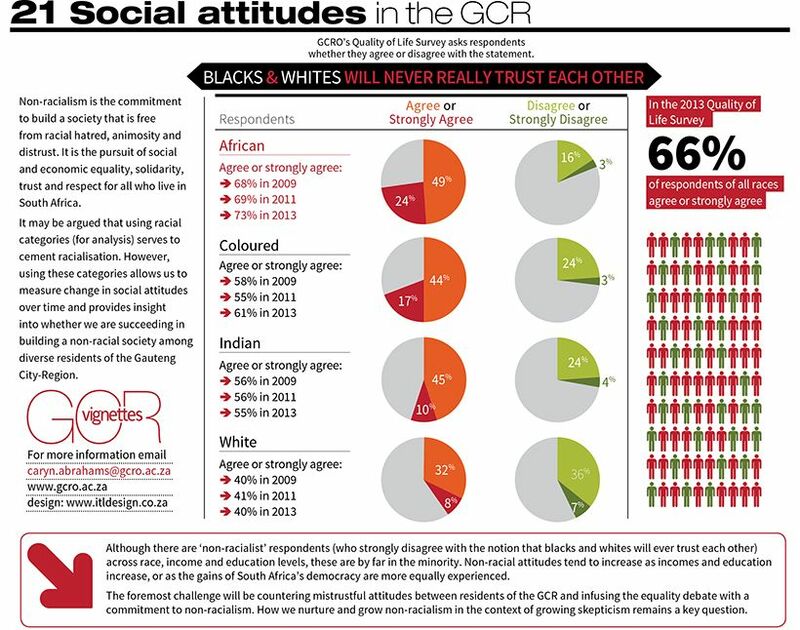 There is far bigger percentage of blacks than whites that don’t trust. Nothing to smile about as it is growing and being driven by growing income disparities. We can all burn if things turn sour. Message: All of us need to work towards a more equitable and stable society. What has become of Boer racism? The 1.6 million square metres Waterfall City which is host to the 130 000 square metre Mall of Africa that started its construction in 2012 is expected to welcome its first customer in April 2016. “Several urban studies have proven that there is an excellent business case for situating the Mall of Africa within the Waterfall City development. The mall will help the City realise its financial potential,” believes Aurecon Project Director, Nicol Labuschagne. The mall is said to cost about R3.5 billion will be easily accessible and is also situated not far from the Gautrain Station in Midrand. With the deadline looming, the construction had to be fast tracked and saw Aurecon “using reinforced concrete flat and coffer slabs for the retail areas and post tensioned flat slabs for most of the parking decks to speed up construction”, according to Labuschagne. “PLZ hlp mi wit rytin a xul poem…” (Please help me with writing a school poem). This is a text message Gwiba Pasiya of Penmanship Gym received earlier this week from a school pupil requesting help writing a poem. Nkosinathi Makhubo is up and ready at the park next to Tiakeni Primary School in Ward 11. Nathi went on Friday with Mr Michael Sibisi, ward committee member, through all the streets of area 1 (of 5) announcing the march etc with a loud healers. lots of enthusiasm! We are waiting for the community to rock up. Lets see…. We are working hard to improve Ongoing Care. This is based on the Integrated Chronic Disease Management programme in the National Department of Health. We have a a record kept by clinicians CCP Ongoing Care Record CLINICIAN 14-10-16, supplemented by a record of functionality CCP Review of functioning and ability. We also work with CHWs to follow up and provide them a plan/record for follow up CCP Ongoing Care Record CHW 14-10-16. This is kept in the CHW folder. As we manage the patient month-by-month we decide that if the patient is stable and not needing monthly visits to us that we can plan it accordingly using the Ongoing Care Records. We ensure the patient gets their medication safely and securely and is followed up regularly by CHWs with a CHW Delivery System using a CCP Chronic Script and a CCP Chronic Delivery form. The CHW record and copies of delivery are kept in the patients folder enabling clinicians to see them for any acute condition and check on their ongoing care. Patients are overjoyed! Senior executives of HealthOne (from Medemass) in South Africa visited Chiawelo Community Practice on Wednesday to explore the set up of HealthOne Patient Record System as their contribution to CCPs service innovation, training, advocacy and research. They felt that CCP was a very useful model for the planned NHI and will be writing up the CCP implementation as a case study. Whilst the system will be implemented mostly using current functionality of the software e.g. records, pharmacy management, etc. the team will be exploring enhancements e.g. genograms, CHW records linked and stronger guideline support. This project promises to show all the possibilities in an NHI system where GPs are allowed to contract. Chiawelo Community Practice is planning an Open Day next week. It is aimed at key stakeholders in Soweto…. part of our advocacy! A chance for key people to go through the practice with fine tooth comb, guided by CHWs mostly.